After a fantastic evening at Jamie Oliver's Cookery School at Westfield Shepherd's Bush, I wanted to share the lovely recipes with you of everything we cooked on the night. 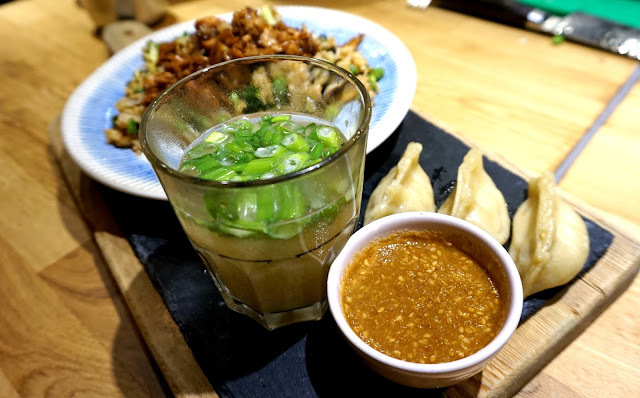 This post will focus on Miso Soup and Pork Gyoza with Gomadare Sauce and the next will show you how to make the Stir Fry and Teriyaki Chicken. 2. Add in the saké and bring the mixture to the boil. Taste the sauce and adjust the flavour to your tastes. 3. Remove the tofu from the packaging and rinse under cold water if needed. Cut into squares and add to the simmering miso mixture. Ensure the cubes are submerged then reduce the heat and simmer the tofu for between 5 to 8 minutes. Ladle the sauce over the tofu occasionally to ensure it is full of flavour and evenly cooked. 5. Toast the sesame seeds in a dry pan until golden brown then sprinkle on top with the black sesame seeds and thin slices of the spring onion. 4. For the gyoza filling, roughly chop the pork belly and blend to a paste in a food processor. the edges with a little water then fold the wrapper in half over the filling to make a half moon shape. Pinch and pleat the edges to seal, then place bottom-side down onto the flour-dusted tray. Repeat with the remaining ingredients. pan over a high heat, then add the gyoza, bottom-side down, in a single layer – you’ll need to do this in batches. Reduce the heat to medium and fry for 2 minutes, or until the undersides are golden. 8. Pour 1cm of water into the pan, bring to the boil, then cover and reduce to a medium-low heat. Simmer for 6 to 8 minutes, or until the liquid has almost evaporated. If it reduces too quickly, top up with a splash more water halfway through. Remove the lid and fry for a further minute, or until the undersides are crisp. the gyoza doesnt sound that difficult to make. looks yum!